For a great chance to explore all aspect of our national obsession with caffene, the 4th annual Coffee and Tea Festival NYC will be host to a spectacular collection of coffee and tea companies from around the country at the Metropolitan Pavilion (125 W 18th St. between 6th and 7th Ave.). Open to both the trade and the public from 11 am - 6 pm on 4-18 and 11 am - 5 pm on 4-19, 2009, the show serves as an opportunity for gustatory professional and the public to meet on this common ground--a love for coffee and tea. Omoma Coffee, SerendipiTea, Café La Paz, Tay Tea, Tavalon, Starbucks, Harney & Sons Tea, Green Mountain Coffee, Keurig, Guayaki Yerba Mate, El Pedral Gourmet Coffee, Hancha Tea, Zen Green Tea Liqueur, Srina Tea, Vittoria Café Coffee, TeLight, Sacred Rose Tea, and Jalima Coffee. The show will also feature some extraordinary related products including Best Friends Cocoa, Biscottea, Deborah’s Kitchen, Chip ‘N Dipped Cookie Co., Erica’s Rugelach, and Taste of Home Bakery. In addition to booths, tastings and opportunities to buy unique products, this two-day event also features a full program of presentations from well-known industry pros and pioneers. Presented by Donny Raus, President of Northeast Roasters Group. 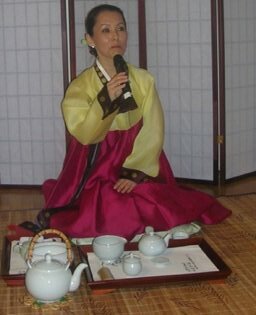 Presented by Yoon Hee Kim of the Korean Tea Culture Foundation. Hosted by Dina Cheney, author of "Tasting Club." Hosted by Marcela Zuchovicki of Jalima Coffee, Sponsored by Gillies Coffee. Presented by Celebrity Chef Melody McGinley Whitelaw. Presented by Yoon Hee Kim, Korean Tea Culture Foundation. Presented by Yoon Hee Kim, Sponsored by TeaClassics. The 4th Annual Coffee & Tea Festival: NYC will also help raise funds and awareness for Cup for Education, the official charity of the event. Cup for Education helps poor and rural coffee communities of Central and Latin America build schools within their communities and provide the basic tools needed to educate the future generations of coffee farmers. Goodie bags will be also be available to attendees each day and include samples from: Adagio Tea, Celestial Seasonings, Wholesome Sweeteners, The Tea House Times, Glee Gum, Teeccino, Choice Organic Tea, Chopsticks Magazine, and others. Washington DC will be hosting a meeting of minds and souls as the Split This Rock Poetry Festival hits the city from April 19 to the 21st. "Split This Rock Poetry Festival: Poems of Provocation & Witness (April 19-21, 2018) invites poets, activists, poetry lovers, and dreamers to Washington, DC for three days of readings, workshops, panel discussions, youth programming, activism. Celebrating Split This Rock's 10th anniversary, the festival will feature some of the most significantly and artistically vibrant poets today, including Elizabeth Acevedo, Kazim Ali, Ellen Bass, Sherwin Bitsui, Kwame Dawes, Camille T. Dungy, Ilya Kaminsky, Sharon Olds, Sonia Sanchez, Solmaz Sharif, Terisa Siagatonu, Paul Tran, and Javier Zamora! The gathering offers opportunities to speak out for justice, build connection and community, and celebrate the many ways poetry can act as an agent for social change. Split This Rock Poetry Festival is DC's premiere poetry event and the only festival of its kind in the country, highlighting poets working at the intersection of the imagination and social change!" 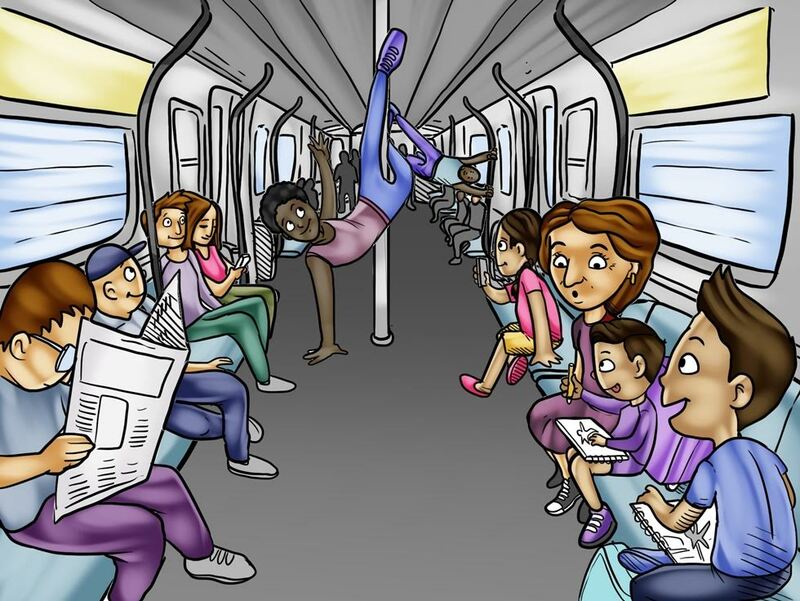 When writer/creator Lapacazo Sandoval envisioned “Taking The E-Train,” her fun guide to riding this major subway line, she did anticipate that her little tome would enjoy life as a multimedia concept. But not until master teacher Amanda McDowall came up with her adaptation of the book as a music theater experience, did this book realize in real-time its possibilities. With that in mind, she married African drumming, song and hip-hop choreography to the lively narrative. McDowall’s day job is teaching musical theater at the Harlem School of the Arts (HSA), so it’s natural for her to be directing of this free theatrical reading of this new children story this weekend, Saturday, November 4th at 10 am. It is the inaugural event to launch a kids music theater series at the school. “Taking The E Train” makes for important selection to serves as the kick off for the reading series. The Harlem School of the Arts (HSA) has partnered with publisher KaZoom Kids iStoryBooks, to launch this reading series designed to stimulate a love of reading, especially for kids of color. Too often African American and Latino children are disconnected from the stories they see in the books available to them because they do not see themselves represented there. This theatrical reading is about adventurous Abuela who takes her three grandchildren on an adventure on the E train on one of the hottest days of summer -- no wonder, because the E train has the best air conditioning. Another story, also a part of the series, is “Everybody Loves Cake,”which illuminates the joy of baking with Sharon and Grandmother Abuela as they create new and delicious treats while keeping tradition and making “sweet” memories. In “Kason’s Kite,” a father and son bond over a kite making project. The multicultural KaZoom ebooks use sight, sound, motion, and animation to stimulate kids to interact and become more engaged with the stories they read. Besides her role as a teacher, McDowall has been dressing the kids who participate in the Macy’s Day Thanksgiving Parade for the past six years. She provides the kids and audience alike with a rich creative experience. Given that Harlem School of the Arts is New York City’s premier community arts institution, McDowall has had an opportunity to do something that can really inspire kids and adults alike. HSA’s alumni and faculty are counted among the most talented leaders in the arts. HSA is unique in that it’s the sole provider of arts education in four disciplines: music, dance, theatre, and visual arts, all within an award-winning 37,000 square foot facility. With a reputation for artistic rigor and excellence it attracts constituents of diverse socio-economic and ethnic backgrounds from all five New York City boroughs as well as Westchester County, Connecticut and New Jersey. For more than 50-years, HSA has enriched the lives of tens of thousands of young people ages 2-18 through its world-class training in the arts. Given the institution’s prominence, it is an ideal platform for multicultural author Sandoval to see her work presented. A longtime contributor to Essence.com and the New York Amsterdam News, the veteran writer has created a whole series of classic New York stories for kids; HSA will be the perfect place to experience them live. The opening night (April 29) lecture on bravery in arts, politics, and society and is hosted by comedian Baratunde Thurston, formerly ofThe Onion and author of the New York Times bestseller How To Be Black. PEN World has several lecture series on various topics, including obsession and the role it plays in the creative process (Naomi Wolf on Truth) and workshops for aspiring artists and writers (What the Wu-Tang Clan Tells Us About Political Publishing with Bhaskar Sunkara). 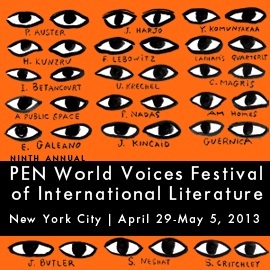 As one of the most major literary events in New York, PEN World Voices offers a wide array of speakers and views, making it an engaging literary event on a global scale.